Merge 2 NSF files or numerous NSF files with NSF merge tool. The software has strong ability to concatenate several NSF files into single NSF in order to provide easy and consolidated file access to the users. NSF Merger Tool Support joining of multiple NSF files into a single folder pattern so that users now able to access all joined NSF files from single folder. For eg: Particular Folder will now contain File1.nsf, File2.nsf and so on. Merge NSF Software, merge 2 nsf files in a certain manner that resulting merged NSF file will contain only one copy of duplicate data items from the multiple NSF files. Thus the Final NSF file is free from any identical chunks of data. If at any point user realize that merging & jonning of Multiple NSF files leads to very large single NSF then he or she can Merge 2 or more lotus notes archives NSFs without merging deleted data items folder. Doing so reduces size of final NSF to some extent. Merge notes archives into single NSF file with the help of Merge NSF software effectively. Also Software allow users to provide a custom or user defined file name to the so obtained NSF file for the ease of users to manage file. Merge NSF software window wizard will clearly displays the live status of merging & joining multiple NSF files. Live Status includes Information about complete hierarchy of NSF files after joining and merged folder of NSF files with removed duplicate count. Using this option the software enable you to merge lotus notes archive databases NSF files into Single NSF file. This will bring together all the information from multiple NSF files to single NSF file. User now get rid of accessing frequently used information from various NSF files and thus save his/her precious time and effort. 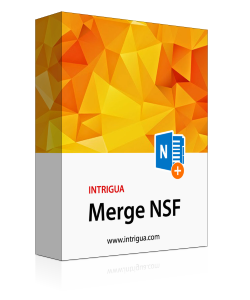 If User opted for Merge NSF file option then software provide two Filter sub-options i.e Remove Duplicate Data items & Exclude delete data Items. Remove Duplicate Data Items: This Filter options will simply remove duplicate or identical chunks of data from multiple NSF files that is being merged into single. Exclude Deleted data Items: To manage the size of resulting Merged NSF file to some extent choose this filter option as this options merge several NSF files without including their deleted data item folders. This Advance feature is little different from the previous Merge options in a certain way. If user select join option then the software will join multiple NSF files into a single folder access pattern. For example all such joined NSF files will be moved to a particular folder and User can have access to these NSF files separately i.e. File1.nsf, file2.nsf and so on are in single folder. Advantage of this options is that user now have one point access of these multiple files. Software provide only one filter sub-options i.e Exclude Deleted Items folders if anyone selected Join feature of Tool. Step 2: Add NSF file or folder for Lotus Notes merge NSF files. Watch this interactive video to know how to merge multiple NSF files to single one using NSF Merge Tool. This video is created for our user to quickly integrate the functioning of tool without facing any intricacy. Can I install this software on latest windows 10? Yes, you can install Merge NSF tool on windows 10 as this tool doesn't have compatibility issue with any version of windows OS. Is this Software append names.nsf to another? Yes Merge NSF Software can successfully append names.nsf to another. Can I merge Domino server NSF files using this software? Yes you can merge domino server NSF files with this tool provided that server is in offline mode. Is this tool able to merge password protected NSF files? No, NSF merge tool will not merge any password protected NSF files. How many NSF files can we merge at one go? You can merge as many as you want NSF files with this tool at one go. 20 MB of free hard disk space should be available to run Merge NSF software. Merge NSF software is an extra-ordinary tool. I have tried its demo version successfully and I really like its unique features. Now I am looking forward to buy full version of this software to completely merge different NSF files. Thanks to INTRIGUA software's for such great creation. Facing problem in managing large number of bulky NSF files as I always need to access data from these files. And Now I want to manage all files into one single file. Fortunately heard about INTRIGUA Merge NSF Software. And Guess what it simply take over my all problems and successfully merge various NSF files into one. Now I can do my work efficiently.